Fri., Feb. 2, 2018, 8:43 a.m.
VATICAN CITY – A group that advocates for greater leadership roles for women in the Catholic Church says the Vatican has refused to let former Irish President Mary McAleese to participate in an annual event marking International Women’s Day, and that organizers are taking the event elsewhere. McAleese, who has a gay son and has criticized the church’s position on LGBT issues, was invited by the Voices of Faith advocacy group to participate in a March 8 panel discussion at the Vatican on women in church governance. In previous years, the Women’s Day event has been held at the Casina Pio IV, a small palazzo in the Vatican gardens that hosts a variety of international conferences. Voices of Faith said it submitted names of a dozen proposed panelists to Cardinal Kevin Farrell, head of the Vatican’s laity office, which for the first time this year was tasked with overseeing the Women’s Day event. The group said Friday that Farrell had rejected McAleese and a Ugandan LGBT rights advocate, Ssenfuka Juanita Warry, as well as a third, unnamed panelist. No reason was given, said Deborah Rose Milavac, a Voices of Faith advisory board member. Rather than hold the event at the Vatican without the panelists, Voices of Faith decided to change venues and hold the conference outside Vatican territory, down the block at the headquarters of the Jesuit order. Milavac said the daylong conference, as it was proposed to Farrell, was to have followed the same structure as in previous years, with individual speakers – Catholic women – speaking about the innovative work they’re doing in the field. The following panel discussion was to have been a more inward-looking discussion on the Catholic Church itself and the challenges it is facing in integrating women in its structure and decision-making. In previous years, Voices of Faith has had some controversial speakers, including Sister Simone Campbell, head of the Catholic social justice lobby Network, which was cited by the Vatican in 2012 for not sufficiently stressing church teaching on abortion. 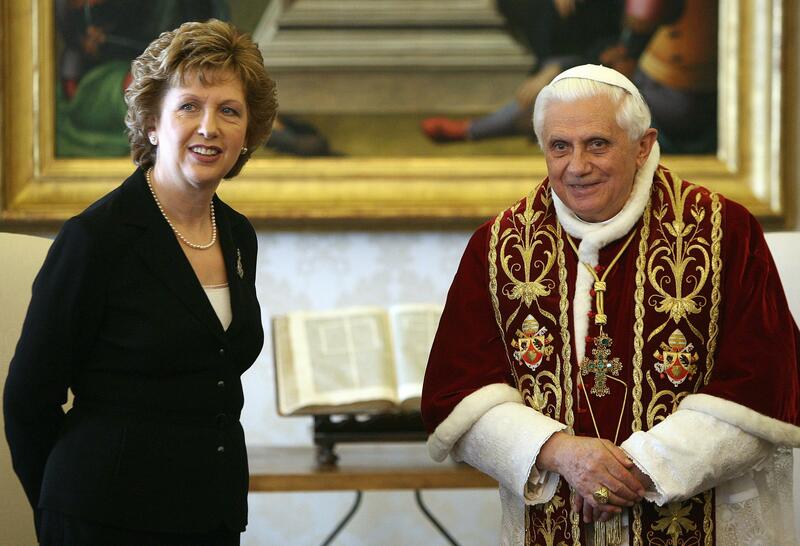 McAleese, who was Irish president from 1997-2011, is an outspoken advocate for gay rights and has called for the Vatican not to exclude gay Catholics from the upcoming World Meeting of Families, which Pope Francis is expected to attend in Dublin in August and which Farrell’s office is organizing. Recently she has expressed dismay at reports that conference organizers had removed an image of a gay couple from a booklet promoting the family meeting that was sent to Catholic parishes. A reprinted version replaced the image with photos of heterosexual families. Published: Feb. 2, 2018, 8:43 a.m.